|HIPPY is a unique and proven education system that addresses the root causes of poverty. Home Instruction for Parents of Preschool Youngsters (HIPPY) is an evidence-based program that works with families in the home to support parents, primarily mothers, in their critical role as their child’s first and most important teacher. HIPPY strengthens families and communities by empowering mothers to actively participate in Canadian society prepare their children for success in school and life. 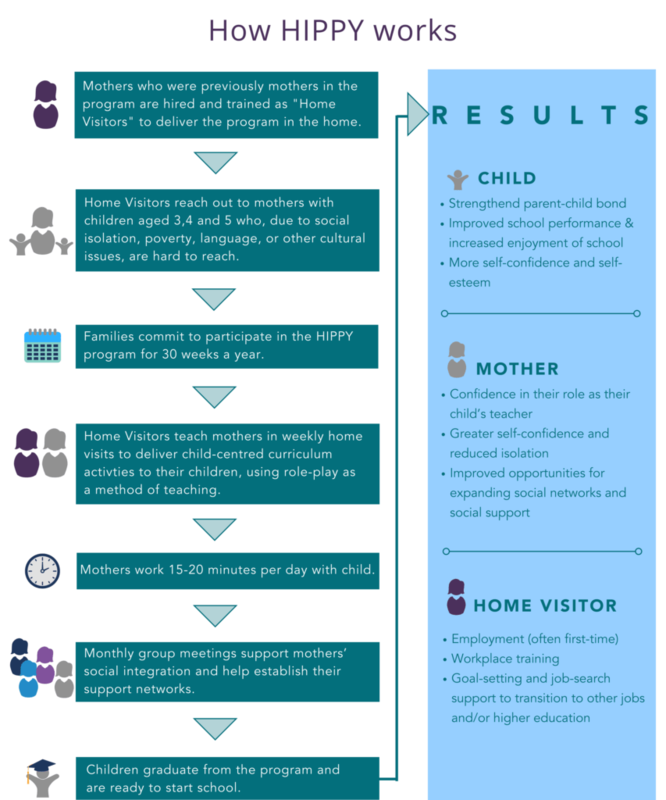 As the foundational program of the Mothers Matter Centre, HIPPY Canada has transformed more than 40,000 lives. Developed in Israel some 30 years ago, today, HIPPY is offered in eight countries around the world. 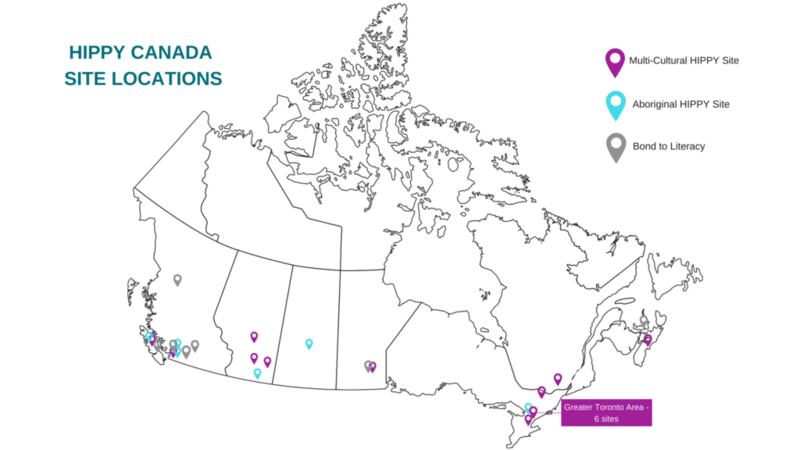 Since its debut in Canada, the HIPPY program has expanded to 25 sites in seven provinces: British Columbia, Alberta, Saskatchewan, Manitoba, Ontario, Quebec and Nova Scotia. There are two branches led by program directors: Aboriginal HIPPY in Canada and Multicultural HIPPY in Canada. While the core of the program remains the same, each branch has modified the curriculum and the delivery strategy to address cultural requirements. The HIPPY program is comprised of four interlocking components – curriculum, Home Visitor visits, groups meetings, and a commitment to continuous training and support at every level of the program. When implemented together these components consistently yield positive outcomes. A visit with our HIPPY site at the Working Women Community Centre in Toronto, Ontario. The HIPPY curriculum is designed for parents and their children, aged three to five years old, and consists of: nine storybooks, weekly activity packages, and basic supplies such as geometric shapes, scissors and crayons for each year in the program. Activity packages are set out as easy-to-follow lesson plans for parents, providing them with developmentally appropriate activities for their children with the objective of ensuring a successful and enjoyable learning experience. The activities guide parents in a process of engaging with their children using structured lessons that will ensure children’s school readiness skills, including: language development, perceptual and sensory discrimination, logical thinking, and problem-solving. The skills and concepts are introduced progressively to the parent and child, first using the physical body, then concrete objects and, finally, representation of objects in pictures, followed by opportunities for practice and learning. The skills are introduced using HIPPY’s wide-ranging, fun, learning activities that include reading, writing, drawing, singing, rhyming, games, puzzles, cooking, baking and more. Parents are encouraged to build on the information in the activity packages in order to infuse the learning in all areas of their children’s lives. 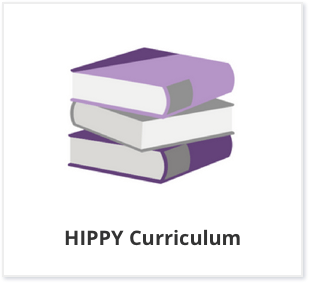 Constant reviewing and updating of the materials ensure that the HIPPY curriculum is relevant for families and reflects current educational research findings. HIPPY facilitates an international exchange of curriculum, additional complementary materials, and extension activities developed in other member countries. The HIPPY program has gained success based on its ability to reach out and work with many of the most hard-to-reach families. 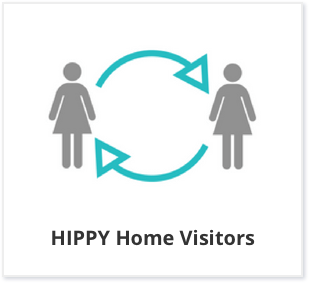 This success is based on the capacity of Home Visitors to build trust with the caregivers and gain access to the home to deliver the HIPPY program to the family. HIPPY Home Visitors meet with the parents weekly to spend an hour reviewing the instructional materials using role-play. Parent group meetings or workshops are held once or twice a month and are facilitated by the HIPPY local Coordinator, assisted by the team of Home Visitors. 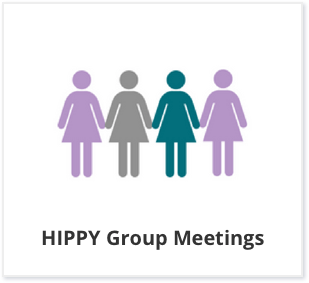 Group meetings bring parents together to share experiences and ideas, reflect on the HIPPY activities, and discuss parenting topics both among themselves and with professional experts. HIPPY parent group meetings and parent-child workshops are stepping-stones for many parents to establish wider-ranging community and school involvement. Training, instruction, guidance, shared learning experience, knowledge and skill-building are core components of the HIPPY experience. 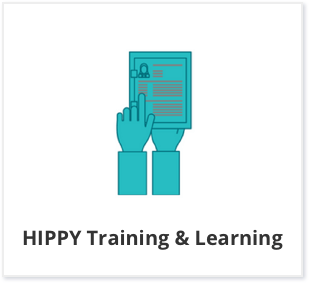 As a learning organization, HIPPY offers several layers of training from the national training sessions to regular weekly local training at the site level. National Office – Local Coordinators: The national office of the Mothers Matter Centre offers an annual conference and mandatory pre-service training along with ongoing professional education courses to Coordinators to prepare them for their role as trainers and coaches of HIPPY Home Visitors. Local Coordinators – Home Visitors: The HIPPY program utilizes a concurrent work-learn training program for Home Visitors. The Coordinator also meets with Home Visitors one-on-one. In the weekly training session, the previous week’s material is reviewed, questions answered, and challenges discussed. Then new material for the upcoming week is studied. As an effective, experiential teaching method, role-play is widely used by Coordinators with their Home Visitors and by Home Visitors with parents. Home Visitor – Parents: With the parent in their weekly, one-hour home visit, Home Visitors use the same role-play method as in their own weekly training sessions. Material from the previous week is reviewed, and questions and challenges are discussed. Then new material for the upcoming week is role-played with the parent. Parents – Children: After the parent is comfortable with the material, she is encouraged to work through the packet on a daily basis with her children. Each parent-child daily session takes approximately 15-20 minutes.